Once upon a time, the corporal punishment of unruly or naughty children was often considered a part of growing up and even a significant element of the educational experience. Principals and delegated teachers had the ability to give ‘cuts’ or ‘strokes’ of the cane as an accepted disciplinary technique for all manner of student transgressions. Some of you may recall that feeling of trepidation as you waited, palm upward, for the cane or ruler to fall whilst trying to appear nonchalant to your watching classmates. Despite the official position on corporal punishment, even as far back as 1941, that “corporal punishment must not be inflicted in departmental schools” it remained as an accepted method of sanction for all ACT schools for decades after. 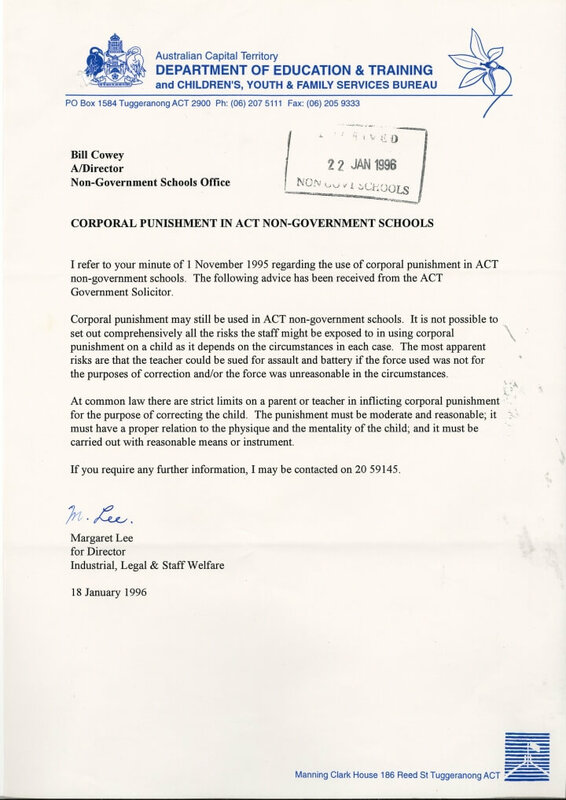 Despite the issuing and reissuing of instructions to end the practice, principals still had the power to use corporal punishment within Territory government schools until 1988, at which point use was completely banned by the ACT Schools Authority. Private schools were not governed by the Authority so were still able to use corporal punishment after this time. It wasn’t until 1997, when the ACT Government amended both the Education Act 1937 and the Schools Authority Act 1976, that corporal punishment was finally prohibited in all ACT schools by law. Each year on Canberra Day, ACT Government administrative records that are 20 year old become open and available to the public. Debate regarding corporal punishment still makes headlines today and for this reason records legislating the abolition of corporal punishment is ACT schools in 1997 have been chosen as ArchivesACT's Find of the Year. One of the more fascinating records available through ArchivesACT is the Territory’s earliest Punishment Book from the Tuggeranong and Williamsdale School. Up until 1976, the education system in the Territory was the responsibility of the NSW Department of Education. The Department required teachers to keep records of each and every infliction of corporal punishment of students within a Punishment Book. Each book made it clear that corporal punishment should only be given for extreme cases of discipline, but our early record indicates that even being caught talking within class was enough to earn one or more cuts of the cane. Far more serious offences, such as stealing, carried anywhere up to six cuts. One student was recorded in 1905 as receiving four cuts for “Destroying the eggs of harmless & useful birds in the school play-ground”. Corporal punishment became a contentious educational issue within Canberra schools as early as the 1930s. Parents began to take a stance on how it was administered and were willing to complain if they felt it was unjustly served upon their children. In 1935, the ACT Advisory Council recommended to Mr Thomas Paterson, Minister for the Interior, that corporal punishment of all girls be abolished from Canberra schools and any corporal punishment of boys be exercised with restraint. This motion was in response to multiple allegations of severe punishment meted out to students of the Telopea Park Primary School by one of its teachers, Mr Clement Hill. Mr Thomas Shakespeare, member of the Advisory Council, indicated that “he had sworn affidavits supporting the contention that many canings administered by a master of Telopea Park Primary School had been unnecessarily cruel”. Given the serious and ongoing nature of these complaints, Mr Alek Hicks, Assistant Under-Secretary and Assistant Director of Education of NSW, decided to chair a public inquiry into the disciplinary action undertaken by Mr Hill. The hearing ran over two days and was held at the Albert Hall on 18-19 November 1935. Parents and students with grievances were invited to attend and give testimony of incidents involving inappropriate punishment by Mr Hill. Up until this inquiry, Mr Hill had been considered an exemplary teacher by the Department of Education who had not previously received any complaints against him. 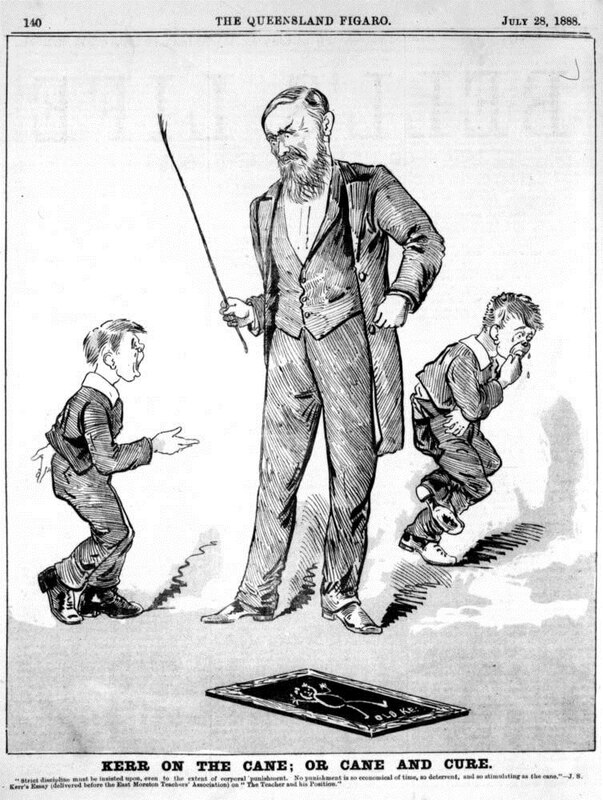 The inquiry aimed to determine if: (a) there was any breach of regulations in the Public Instruction Act 1880 governing corporal punishment; (b) an abuse of authority by either the headmaster or delegated teacher; and (c) disgraceful or improper conduct. The representative of the Telopea Park School’s teachers, Mr F Mitchell, said “that although the teachers welcomed the inquiry, it was quite irregular”, and hinted of it even being improper. The inquiry was given plenty of attention by The Canberra Times which published a detailed description of the proceedings. Ultimately, the inquiry found that there were no charges whatsoever against the headmaster and that the “punishment inflicted in the school has been neither unduly severe nor contrary to the regulations governing corporal punishment”. After the inquiry, the ACT Advisory Council was active in monitoring the regulations around corporal punishment use in Canberra schools. However, at the Council’s 30 June 1941 meeting, it was announced that no clarification had been provided by the NSW Department of Education regarding the edict against caning in government schools and corporal punishment continued to be carried out for another thirty years. Each school continued to implement its own disciplinary measures. In 1973, the Territory separated from the NSW education system when the Whitlam government created the ACT Schools Authority . It didn’t take long before the Authority turned its attention to behavioural and disciplinary issues, including how corporal punishment could be completely phased out from the government school system. In 1979, a set of draft guidelines on discipline was issued which stated that corporal punishment for girls over the age of 12 years was to be prohibited, for all other students only the use of a light cane on the palm of the hands was acceptable. Parents could also make a request to the principal that their child not be caned. Corporal punishment is generally being replaced with more socially acceptable forms of student discipline. Most countries of the developed world have abolished corporal punishment in schools. The literature substantiates the notion that corporal punishment has doubtful outcomes in changing behaviour and that it is counter-productive in developing self-discipline in students. During the 1980s, a downward trend developed in the overall use of corporal punishment within Territory government schools. Statistics showed that in 1983 the number of incidents of corporal punishment in government schools was 372 across 29 schools, by 1986 the number had dropped to 81 incidents across 10 schools. Despite changes to the corporal punishment policies in government schools, private schools were still able to implement their own strategies. 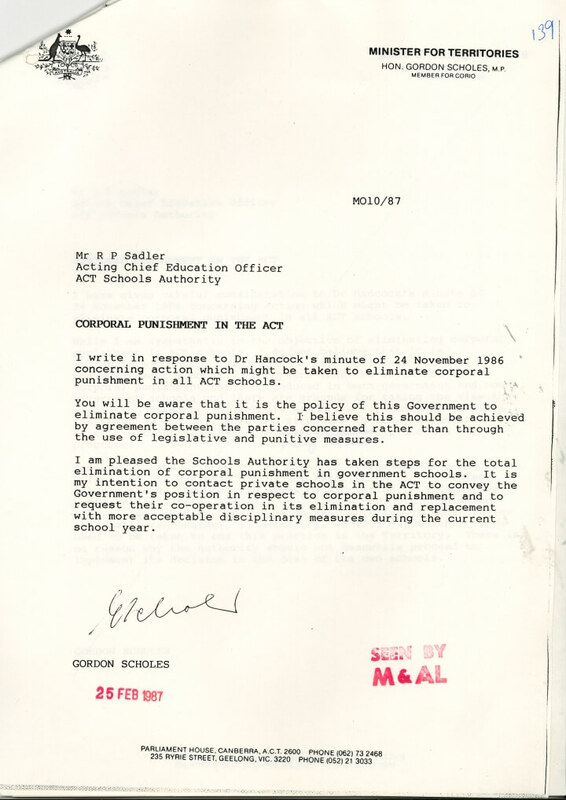 The ACT Schools Authority had been advised by Mr Gordon Scholes, the Minister for Territories, in early 1987 that he believed the elimination of corporal punishment should be achieved by agreement between the public and private education sectors, rather than through the use of legislative or other punitive measures. The thought was that the steps taken by the ACT Schools Authority to ban the practice within government schools would be enough for private schools to follow suit on their own terms. But the two sectors were to remain at odds. The main concern of the ACT Schools Authority was they considered use of corporal punishment on students as a social policy, human rights issue rather than an education policy issue, with corporal punishment having no place at all within schools. 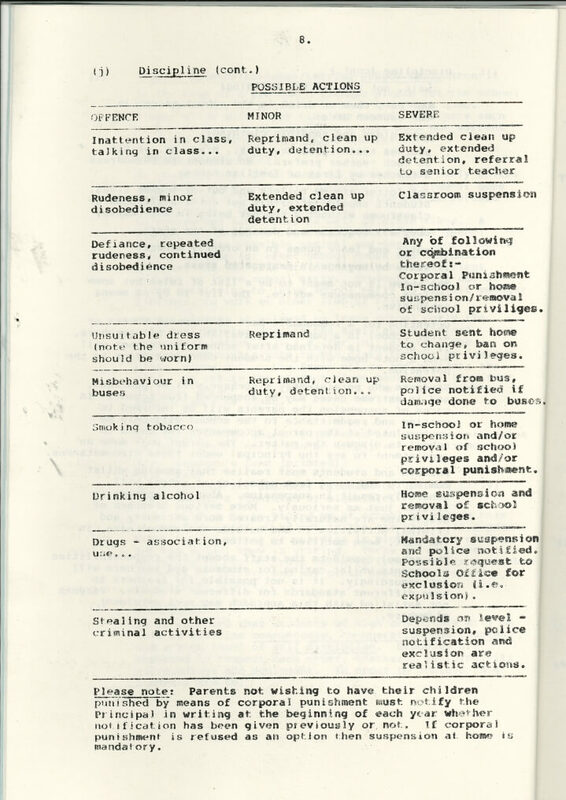 A 1986 study into disciplinary policies was encouraging. It demonstrated that more socially responsible forms of student discipline were replacing corporal punishment, including the greater use of detention and counselling of students. All government schools were expected to have behavioural management policies in place, which completely removed corporal punishment as an option, for the start of the 1988 school year. 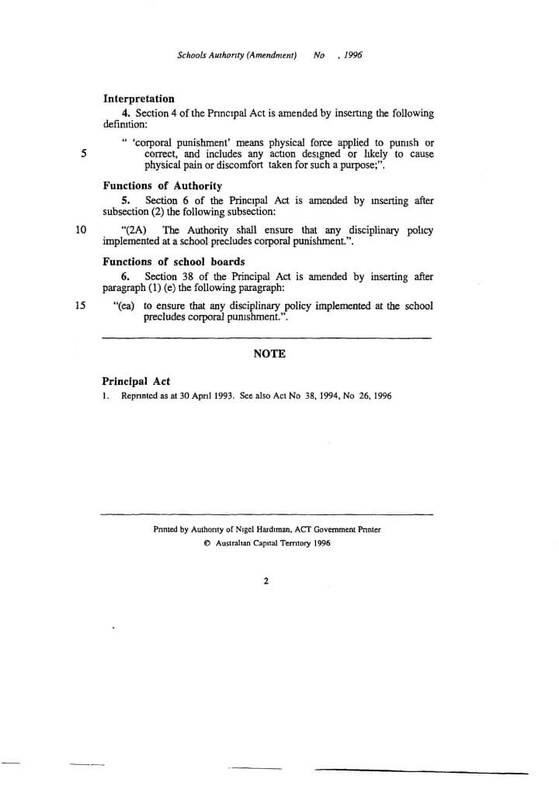 The ACT Teachers’ Federation had been advocating the removal of corporal punishment in all schools since the early 1980s, considering it to be an outdated practice that was reminiscent of Australia’s colonial past. After endorsing a policy in 1982 condemning the use of corporal punishment, the Federation continued to agitate the Federal Government to introduce legislation to abolish it in all government and non-government schools. By October 1987, Mr John Brown, Minister of Arts, Sport, the Environment, Tourism and Territories took up the task of removing corporal punishment by looking at “any proposal by educational groups for the abolition of corporal punishment in ACT Schools”. Senator Robert Ray, Minister for Home Affairs, told the Senate that “Mr Brown was considering whether to introduce an Ordinance banning corporal punishment in all ACT schools ”. Amending the ACT Education Ordinance was seen as an attractive option for dealing with the issue. But given the apparent low number of incidents, the government speculated if the matter really warranted “diverting attention from other more important issues”. Ultimately, ACT non-government schools were asked to develop similar policies to those of the ACT Schools Authority as a solution, rather than legislation. While the non-government school sector continued to allow corporal punishment at part of their disciplinary approach after 1988, ACT Catholic schools banned the use in 1992. Five independent schools chose to retain corporal punishment within their policies after 1988 but by the 1997 abolition, only two were actually still administering it, in limited circumstances. At least one Canberra private school started to examine the legal ramifications for continuing the use of corporal punishment. In November 1995, the Department of Education & Training asked the ACT Government Solicitor for its advice. The Government Solicitor’s response was framed around the potential for teachers to be sued for assault and battery if the punishment was considered unreasonable for corrective purposes. 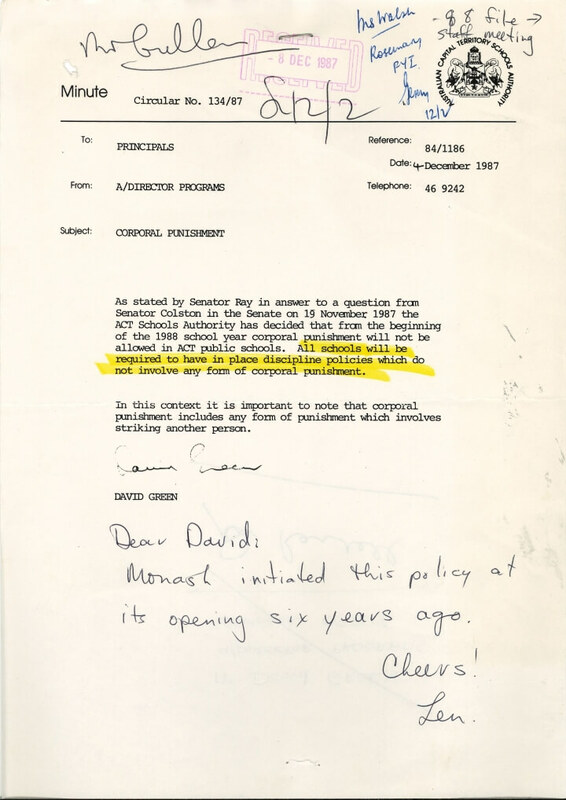 During 1996, Independent MLA Michael Moore championed the cause to prohibit corporal punishment from all ACT schools, and in August that year requested the Parliamentary Counsel draft legislation. 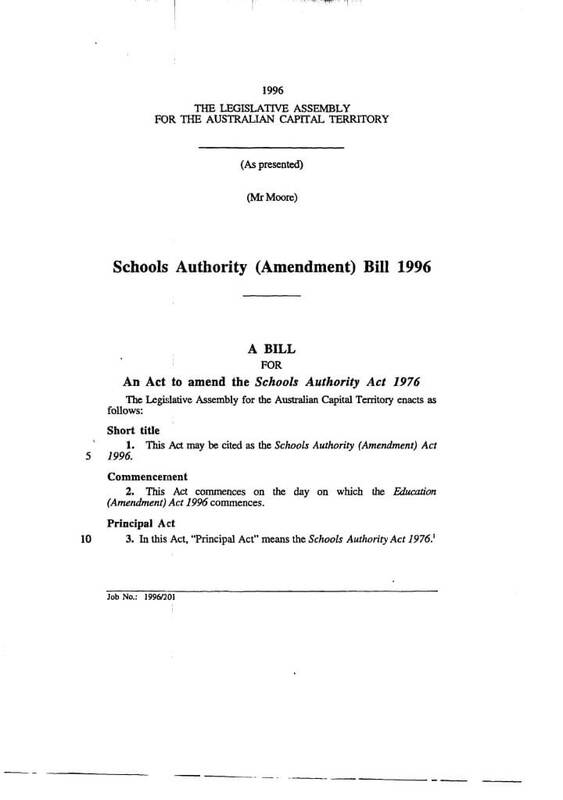 Inspiration was drawn from the recently enacted NSW legislation and on the 3 December 1996, Moore gave notice to the Legislative Assembly to present a Bill amending both the Education Act 1937 and the Schools Authority Act 1976. The main component of the amendments to section 36 of the Education Act were designed to “deny the availability of the defence of corporal punishment in certain civil or criminal proceedings” for teachers who are either prosecuted or sued for assault or battery. Other amendments within this Act included placing new conditions on private schools in relation to their registration that could be placed at risk if conditions relating to disciplinary policy are not adhered to. On 14 May 1997, the proposed amendments passed the Legislative Assembly. It seems that not every school community was happy about the passing of the legislation. In 1997, Covenant College wrote to Mr Bill Stefaniak, Minister for Education, saying that the passage of the Education Amendment Act had “special significance for Covenant College”. 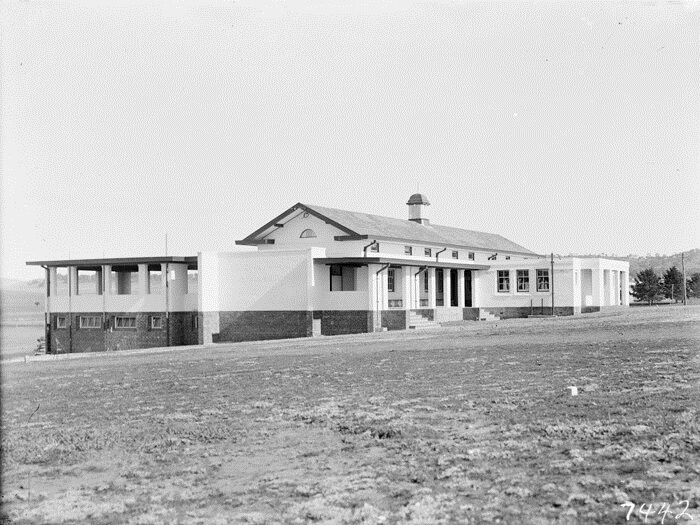 As one of the remaining schools to still administer corporal punishment at the time of abolishment, the school felt this prohibition would affect the overall school community. Covenant College believed that the continued use of corporal punishment was one of the reasons families chose to send their children as it reflected their own values in relation to discipline. On 4 November 1997, the Tuggeranong newspaper The Valley View published some of the thoughts around the abolition of corporal punishment from Year 2 and 3 students of Covenant College. The students had written letters to Legislative Assembly MLAs saying they were unhappy with the decision. One statement read: “It was much easier to have a quick smack and get it over and done with than to have to stand outside, go write lines and have to go on detention”. Not everyone was convinced that the students was completely responsible for the letters as they included language not typical of nine year olds and lacked spelling errors. A spokesperson for the Education Minister suggested that perhaps parents, teachers or other adults had influenced these missives. After more than fifty years of community and inter departmental debate, public meetings, complaints and inconsistent compliance, the School Authority (Amendment) Bill 1996 finally saw an end to corporal punishment in the Territory. We hope that you have enjoyed our research into records regarding corporal punishment in the ACT. 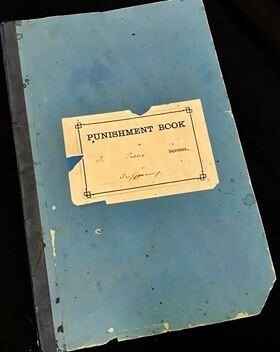 If you would like to view the Punishment Book of the Public School at Tuggeranong and Williamsdale 1898-1939 it will be on display at the ArchivesACT Reading Room for the next month. Please contact us if you would like to book an appointment time. Do you have any memories of corporal punishment while at school? 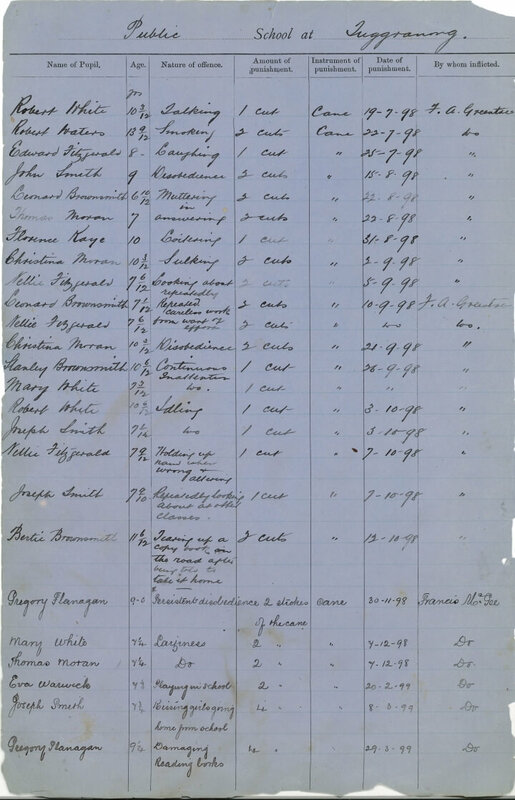 If you are interested in further research of our corporal punishment records, please contact ArchivesACT through our “Request a Record” service. A Study of Discipline Policies and Practices in ACT Government Schools: Summary; Canberra: ACT Schools Authority, March 1986. Charnwood High School Information Handbook 1986.